McAfee Antivirus Plus 2017 is more than just an antivirus service. Read on to find out why. Click here to visit Official McAfee website. No limit to the number of devices you can protect on platforms such as Windows, Android, iOS, and macOS X. The iOS and macOS X versions don’t have as many features as the Android and Windows versions. McAfee Antivirus Plus is a very solid antivirus software application. But it finds it tough to give some of the other elite antivirus software applications a good run for their money. It has more features than many other antivirus applications and allows users to protect all of their devices regardless of platform or operating system with just one subscription package. Forget about the good old days when you didn’t get a headache while differentiating between a security suite and an antivirus. Because now, most antivirus software applications are practically security suites. And security suites are, well, security suites. McAfee AntiVirus Plus 2017 has a lot of things going for it. One of them is the firewall protection along with a ton of other security features. But most of all, from a price point of view, it allows users an unlimited number of installations on any number of devices. McAfee AntiVirus Plus 2017 will protect all. Antivirus software applications didn’t always do that. But antivirus applications have now evolved. They have evolved to offer multi-platform antivirus protection. McAfee AntiVirus Plus 2017 is not the absolute best antivirus software application money can buy. The fact that it can protect all of your devices on its own gives it a considerable advantage over the rest of the pack. 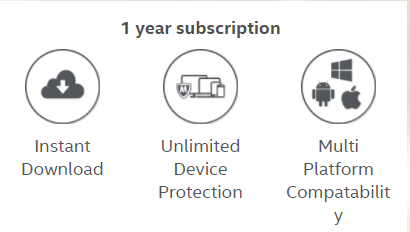 A single year’s worth of subscription will cost you $59.99 and you’ll get one license to protect all your devices. As you can probably tell, this is rather expensive. The industry average is around $39.99. Moreover, antivirus software applications like Bitdefender Antivirus Plus 2017 only cost $19.99. Other elite antivirus applications such as Kaspersky, Webroot and Norton offer packages at a similar price as well. That makes McAfee AntiVirus Plus 2017 undoubtedly more expensive than other elite antivirus software applications. But as noted before, McAfee AntiVirus Plus 2017 allows you to install its antivirus protection on any number of devices in your house, or office. It supports all major platforms such as Android, iOS, and Windows. Now even though we think it is slightly more expensive than other antivirus software applications, overall, it is not expensive. You may even find it a bargain if your needs match what McAfee AntiVirus Plus 2017 has to offer. Make no mistake, the multi-device mode is a great feature. More often than not, it influences the users how they install their security product. To get it up and running, you will have to redeem your product key via online methods. The product key is 25-digit long so it’s best if you get some rest before proceeding with the process. Mcafee allows users to either add their redeem code to their McAfee account or start by signing up for a new McAfee security account. After that, all you have to do is log in to your account. Then download the McAfee software and then use it. You can also send a download link to any of your other devices via email if that’s what you want. McAfee has done something different this year. This year it has come up with a Virus Protection Pledge offering. Basically, if McAfee’s antivirus protection cannot get rid of a virus or any other type of malware code and you contact the tech support AND they can’t solve it either, THEN you get a full refund. Do take note that McAfee tech support comes in the form of remote diagnosis as well as remediation. It isn’t like those customer support features who read off answers from a FAQ booklet. The Virus Protection Pledge comes for free with a catch. Yes, we actually said that. To enable Virus Protection Pledge, you will have to sign up for McAfee automatic renewal. Without that, you can’t use the Virus Protection Pledge. But for the amount of convenience McAfee AntiVirus Plus 2017 offers you, we think it is a fair deal. Norton does a similar thing where it requires the user to sign up for automatic renewal or a direct purchase. And Norton does not offer this feature with its Symantec Norton AntiVirus Basic. It only offers it along with its security suites. Check Point’s guarantee is only available for its premium products such as ZoneAlarm Extreme Security. The difference between McAfee Antivirus And McAfee Antivirus Plus? If you want to sign up for just a single device and on the PC platform only then you can sign up for McAfee Antivirus. Minus the Plus in its official name. As it turns out, a lot of people are willing to pay $39.99 for a single PC device rather than $59.99 for an unlimited multi-device package. Let’s move forward regardless of the answer. The new installation process is thankfully streamlined. As of now, you don’t have to perform many clicks. In other words, the installation process hardly requires any kind of user interaction. First, the product will install itself on your device and then it will update itself. Originally though, McAfee AntiVirus Plus 2017 didn’t ship with a new user interface. Then, the user interface looked a lot similar to the user interface of the previous version. But behind the scenes, McAfee is putting its engineers to work. And has rolled out an entirely new user interface, albeit gradually. There are no large panels which took up the entire main window screen. Now you have a menu that has five pages. But there is a new user interface that lists and then links to each and every feature the program has to offer. We should also point out that you may or may not have this new user interface the moment you install McAfee AntiVirus Plus 2017. But over a period of time, you will get it once McAfee AntiVirus Plus 2017 updates itself. McAfee AntiVirus Plus 2017 updates itself automatically, so you will not have to do anything to get the new user interface. 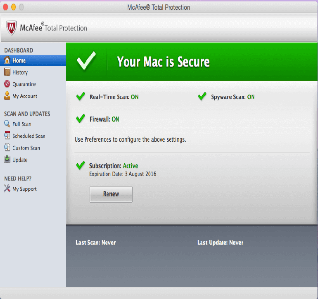 Real protect is the latest virus detection engine from McAfee. It is also a remediation engine. And the whole package is called Real Protect. The new McAfee antivirus engine makes use of behavior-based detection to a great extent. This newer mode of detection allows it to minimize the user’s local signature database. The Real Protect engine also enables McAfee AntiVirus Plus 2017 to detect and stop zero-malware more efficiently. So what does McAfee AntiVirus Plus 2017 do when it encounters a bad/suspicious unknown program? It sends the relevant behavioral data to the McAfee cloud where that data is analyzed. The new McAfee AntiVirus Plus 2017 also creates a logbook of the unknown program’s behavior. If the McAfee cloud component comes back and reports the program as malicious then it blocks all malware activity and rolls the program back into extinction. This is quite similar to what Webroot SecureAnywhere AntiVirus does. To fully understand McAfee AntiVirus Plus 2017 effectiveness, the best way is to compare independent performance test results of the new product with the results of the older version. And one has to do that across multiple and varying metrics to fully understand how good, or bad, McAfee AntiVirus Plus 2017 is. Sometimes reviewers can also run tests on a high-performance machine as well as on a budget device just for comparison’s sake. Our research for this McAfee AntiVirus Plus 2017 review tells us that McAfee AntiVirus Plus 2017 takes less time for a full system scan and then a repeat scan on a budget device than its previous version. Expect the full scan to take about an hour and a half. About twice as long as the industry average. But the speed of any scan is immaterial. Because modern antivirus software applications allow you to use your PC while the scan is “happening”. What about the repeat scan then? The repeat scan should take you around 35 minutes or so. Reviewing antivirus products is difficult. Independent lab test results quickly become dated. But generally, that isn’t a problem. Because individual vendors do a great job of keeping their antivirus definitions updated. So the definitions don’t get old between big revisions. 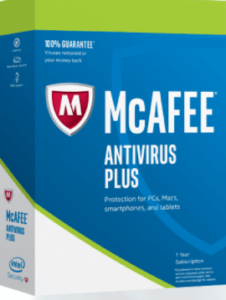 McAfee AntiVirus Plus 2017 is a different kind of antivirus product. Because it introduced its new antivirus engine in gradual phases. The process probably took a few months. This gives independent labs less time to test an antivirus product. For McAfee’s sake, the latest lab results have only improved for its McAfee AntiVirus Plus 2017 offering. Security experts at AV-Comparatives carry out a decent array of malware tests on all major antivirus products. They also do the same for many other kinds of security products as well. Generally, it is enough to judge an antivirus product on five of these tests. If an antivirus passes a test then it gets a Standard rating. Antivirus products that perform more than the minimum requirements have the opportunity to earn further ratings such as Advanced and Advanced + . McAfee only competes in three of such five AV-Comparatives tests. In our research, it earned on Standard rating and two Advanced ratings. Other top antivirus products such as Kaspersky and Bitdefender passed with Advanced+ ratings on all five tests. And basically destroyed the competition. AV-Test Institute carries out multi-faceted tests to really judge an antivirus product’s capabilities. It’s scoring methods are simple. Then, it assigns each antivirus product up to six points for every category. McAfee AntiVirus Plus 2017 scores an ace in the usability test. It means that it didn’t make mistake legitimate websites and programs as malicious ones. On the performance metric, McAfee AntiVirus Plus 2017 scored an impressive 5.5. Overall, McAfee AntiVirus Plus 2017 managed a total score of 17. That is a great score. But it isn’t better than Kaspersky’s 18. Other antivirus products such as Bitdefender and Trend Micro Antivirus + Security scored a 17.5 on AV-Test Institute tests. But are AV-Test Institute tests reliably for real-world protection as well? But the people at Simon Edwards Labs aren’t going to give up. They test antivirus products a bit differently. First, they capture web-based attacks. And then use a complex replay system to attack each antivirus product with the same attack again and again. The lab has five levels of certifications. The latest lab results show that McAfee AntiVirus Plus 2017 has earned a B. Previously it scored an A on the Simon Edwards Labs tests. One of its very specific tests measures antivirus protection via banking Trojans. 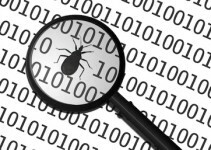 Other tests attempt to test antivirus products via a comprehensive selection of the most active types of malware. Most labs offer a range in terms of scoring, as you have already seen. But MRG-Effitas’ scoring system consists of words. McAfee AntiVirus Plus 2017 earned a FAIL in both above-mentioned tests. Most antivirus products fail MRG-Effitas tests for a variety of reasons. One is that they score based on a pass-fail method and hence one should not give too much weight to MRG-Effitas test results. McAfee AntiVirus Plus 2017, in our view, should earn a total of eight from a possible score of ten as far as antivirus products go. Other antivirus products such as Kaspersky Anti-virus along with Norton and Bitdefender score much higher in our other antivirus reviews. As alluded to before, McAfee AntiVirus Plus 2017 has a new behavior-based engine. Consequently, McAfee AntiVirus Plus 2017 does not scan files and folders on access. What it does is that it waits till the user launches the file. Then it analyzes it and destroys it immediately if the file is judged as a known threat. Otherwise, it keeps tracking the file’s behavior. And if necessary, is able to roll back any and all malicious actions. McAfee AntiVirus Plus 2017 Real Protect engine is a potent weapon against malware. That is for sure. Our research, for this McAfee AntiVirus Plus 2017 review tells us that McAfee is over 90 percent effective against malware samples. Hence scores above nine out of 10 possible points. With that said, it missed harmful ransomware specimens and that is concerning. Ransomware can block out your computer by encrypting your files and then displaying a ransom message. And if an antivirus product misses it then it’s bad news. Since most ransomware samples first encrypt a user’s files and then send the message, it strange why McAfee AntiVirus Plus 2017’s new Real Protect engine did not spot this behavior. One should always test an antivirus product with zero-day samples. This ensures that you know how your antivirus product will perform when up-to-the-minute new threats come calling. MRG-Effitas, supplies a list of malware-hosting URLs. You can test your antivirus product with that list. Each of the links on the list points directly to a known and confirmed malicious executable. To test an antivirus product, it is a good idea to go to each URL turn by turn and check if any of the links are non-functional. Meanwhile, one also has to keep a record of how, and if, the antivirus blocks the malicious URL. An antivirus product must completely block the malicious URL. It should also destroy the attached downloaded payload. If an antivirus product just sits by then, of course, it has failed the test. As far as McAfee AntiVirus Plus 2017 is concerned, its WebAdvisor feature which comes in the form of a browser extension is impressive. And it provided it as well. If you try to download something, it always shows a banner. This banner tells the user that it has begun the examination process on the download. And then it warns if the downloaded file is dangerous. That is exactly what McAfee AntiVirus Plus 2017 did. But sometimes, the warning did not materialize. And the download kept on going. Upon completion, the real-time protection system caught it, scanned it and then removed it. Our research for this McAfee AntiVirus Plus 2017 review shows that one time out of a hundred it is possible that the WebAdvisor may scan a file and give it the green light even though it is from a malicious URL. In that case, expect the McAfee real-time scanner to come through and mark it appropriately as suspicious. McAfee AntiVirus Plus 2017 has two protection layers in this regard and the two are not the same. And that should work fine for anyone who is serious about online security. Overall, McAfee AntiVirus Plus 2017 blocks 85 percent of the given malware downloads. The majority of which it can block within the browser. The industry average is 70 percent so McAfee AntiVirus Plus 2017 is above-average in this regard. But there are better products. Like, Avira Antivirus Pro 2016 blocked 99 percent of the given malicious URL in a comprehensive manner. On the other hand, Norton blocked an impressive 98 percent. You can have as much malware protection as you want. That still will not help you if you give up your security credentials to a phishing website. Phishing websites are fraudulent websites that look like legitimate websites. Modern antivirus products come with a separate component that deals with detecting and blocking phishing websites. And as expected, McAfee AntiVirus Plus 2017 has one too. But what about its accuracy? In our research for this McAfee AntiVirus Plus 2017 review, we have to say that McAfee AntiVirus Plus 2017 did not perform as well as we expected. There are these anti-phishing websites that you can visit and download data about phishing sites from then. Then you can use the URLs listed on these websites which are new. How do you know which ones are new? The “new” are the ones that are reported as Fraudulent but are not yet classified nor blacklisted. To test an antivirus product one has to launch each given URL at the same time. One has to do it on a system which is protected by an antivirus product that needs testing. Then you need to compare results with other top antivirus products. For protection against phishing sites, Norton is king. So we must compare McAfee AntiVirus Plus 2017 with Norton when it comes to anti-phishing feature effectiveness. Just a year ago, McAfee AntiVirus Plus 2017 scored just 2 percentage points below Norton. It also beat all the three above-mentioned browsers. As you can probably tell, last year, McAfee had its game face on. As for McAfee, it is now a whole 44 percentage points below Norton. It is also 40 percentage points below Chrome. 24 percentage points below Internet Explorer. McAfee did manage to beat Firefox though. But Firefox has not performed well in antiphishing tests recently. Always have your internet browser’s phishing protection turned on. McAfee AntiVirus Plus 2017 can act as a good backup whenever your internet browser misses one. The Windows version is the most powerful of them all. Once upon a time, firewalls bombarded users with impossible-to-understand security questions. Because granting the user the ability to decide if an unknown program should get internet access or not is a bad idea. Most of the people don’t have enough time nor patience and simple click Allow for all such notifications. Some are the opposite. They block everything. And then break something critical. Only after that, they switch to Allow. And maintains a strict watch over the behavior of unknown ones. As soon as it detects that they are abusing the user’s network connection, it shuts them down. The point one should note here is that modern firewalls don’t show users program control interfaces until and unless they want to. McAfee AntiVirus Plus 2017 Firewall does that. And it allows users to open Firewall settings and make the necessary modifications. McAfee AntiVirus Plus 2017 firewall also allows the user to change the Traffic Controller settings. Users can change default settings from Smart Access to Monitored Access. Expect McAfee AntiVirus Plus 2017 firewall, to catch unknown software consistently when in Monitored Access. Every Time it does so, it will ask you to give it proper permissions. Users who don’t want pain should stick to the Smart Access setting. Windows also has a firewall feature. Some of them involved blocking port scans. Others require the firewall to put all ports in a new stealth mode. Because if a firewall wants to replace the Windows firewall, then it should have the capacity to take over those functions and tasks. McAfee AntiVirus Plus 2017 firewall can put ports in stealth mode correctly. It can also defend against web-based attacks. For the more experienced users, the firewall has tons of configuration settings. There is an Intrusion Detection feature which you can turn on/off. You can also view and then modify program permissions. The firewall also has settings for opening ports and much more. But, chances are that you are not a network expert. If that is the case then you should avoid messing with the default settings. There is also a Traffic Monitor feature but it is, again, not every useful to users who don’t understand much about how networks work. Other antivirus products like Norton have another special quality. That special and rare quality is an intrusion detection system that not only blocks exploit attacks, it blocks them at the network level. There are many antivirus product components which can take care of SOME, and not most, executable payloads. Last year, McAfee AntiVirus Plus 2017 caught 33 percent of the exploits it got tested with. With the new antivirus engine now, it detects way less. There is this thing called CORE Impact penetration tool. Out of the 30 generated exploits via CORE Impact, McAfee AntiVirus Plus 2017 stopped just two. With the Intrusion Detection System enabled, McAfee AntiVirus Plus 2017 blocked another two. The browser also showed an error message but McAfee didn’t show anything in the log. So, there is some amount of uncertainty here in this test. Hackers are smart these days. If a hacker knows how to code malware then he/she CAN disable a user’s firewall protection via various programs. Antivirus products should protect against these as well. So how do you check for that? You see, just like any other program, McAfee AntiVirus Plus 2017 has this huge Registry. It has more than 750 Registry keys along with over 2800 registry values. You have to check all of them to know if there is an off switch. Our research McAfee AntiVirus Plus 2017 shows that McAfee does have a switch. But turning it on or off didn’t activate or deactivate the firewall. This switch is just an indicator of whether the firewall is on or not. It is not a control. Our research for this McAfee AntiVirus Plus 2017 review tells us that if there is a process that you can kill (out of the 14 running ones), then it is the WebAdvisor. McAfee AntiVirus Plus 2017 armors the rest pretty well. McAfee doesn’t protect Windows services that well. Users can stop and then disable as many as eight of these and McAfee still won’t show anything. Of course, it is not a problem since most Windows services that can be stopped by the user are not critical. But to see an antivirus product showing the big green text “The Computer Is Secure” even when the Windows components are disabled is surprising. We have talked about it before as well but let’s dive into it this time. The WebAdvisor component can guard against dangerous downloads. It can also identify fraudulent websites as well as malicious URLs. Moreover, it has the ability to mark search results. McAfee also actively keeps a record of sites it has vetted. 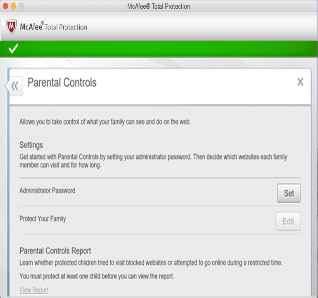 Other top antivirus products such as Norton also have this feature in the form of SafeWeb. The WebAdvisor feature only uses McAfee’s proprietary Secure Search to mark up results. If you want to increase its effectiveness, we advise that you should configure it in such a way that it marks up results in all/any search engine. The WebAdvisor feature also shows the user a brief explanation popup when the mouse cursor hovers on the site-rating icon. If the user clicks the link, then WebAdvisor takes the user to the website for a full report. The full reports aren’t so detailed though. Before the McAfee SiteAdvisor was more comprehensive in our opinion. The new WebAdvisor also protects users from typo fraudulent sites. What are type fraudulent sites? These are sites which attempt to defraud you when you misspell a popular website. These sites deliberately have addresses which are slightly misspelled versions of known and reputed websites. Just to take an example, a user could type faecbook.com instead of facebook.com. A single McAfee AntiVirus Plus 2017 subscription allows you to install McAfee AntiVirus Plus 2017 on all of your devices. That is, all of your devices on your network. Your network could be anywhere or anything. If you use a separate PC for office work then with McAfee AntiVirus Plus 2017 you can protect your kids’ laptops and desktop computer at home as well. Moreover, McAfee AntiVirus Plus 2017 gives you the My Home Network feature to let you monitor the protection of your machines at home. If you click on this feature and open its dedicated window then it will show you all of your devices which are connected to your network. It will also show you the computer name for each device along with the IP addresses of all the devices. Additionally, all computers which are protected via McAfee AntiVirus Plus 2017 have a McAfee shield logo. If you want to set up a trust between any two of your machines then you will need to enter a passphrase on one of them. Then you will have to submit it. And then you will have to enter the same passphrase on the other device/computer. This essentially establishes the trust relationship between the two machines. Using the network map, you can view the status of any of the trust-connect machines. If you find that there is something wrong with your trust configuration then you can change it. Your kid may turn off the antivirus protection during online gaming, but McAfee AntiVirus Plus 2017 provides you with the tools to fix the configuration remotely. The My Home Network is a very useful feature. Just like the new Bitdefender Antivirus, the McAfee AntiVirus Plus 2017 is more of a suite rather than a nominal standalone antivirus. Because of its bonus features. This feature scans your computer for, what some of us would call, junk files. Now, these are the default settings. If you want to add some more obscure categories then you can. You can set the QuickClean feature to scan for memory images files along with thumbnail caches. QuickClean can also scan your Registry if you want it to. It wipes out cookies, your browser history, and cache files with ease. You can either launch it manually or set up a schedule for regular cleaning. You must have heard about the recent data breaches. Did you know that most of them happen because the related institution or company does not keep its system updated? 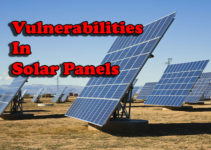 You must patch your system to make sure it is safe against cyber attacks. And that’s what McAfee AntiVirus Plus 2017 Vulnerability Scan does for you. It scans your computer for security updates which are missing. It does that for all popular programs along with the ones related to Windows. The Vulnerability scan goes through your machine once a week by default. After it has done its work, it waits for the user permission in order to install those updates. Which is great since you know what’s happening all the time. 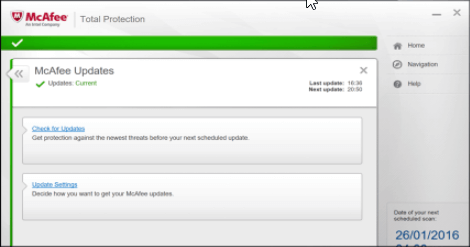 McAfee AntiVirus Plus 2017 gives you the option to schedule more regular Vulnerability Scans and you can have the Vulnerability Scan install updates automatically on its own. When you delete a file in Windows, it doesn’t just go away. It stays in the Recycle Bin. What you may not know is that even if you delete the file from the Recycle Bin it still doesn’t go away completely. The data that is associated with the deleted files still gets to live on your disk. It doesn’t go away until you overwrite it with another file (that happens automatically). McAfee AntiVirus Plus 2017 file shredder features offers new users four levels of solid security. The Basic level performs an overwrite over the deleted data a single time. While the Complete level overwrites the deleted file a mammoth 10 times. McAfee AntiVirus Plus 2017 File Shredder can shred Temporary Internet Files along with the Recycle Bin contents and/or any other type of files that you may choose. There is also a Shred option which you can make use of by performing a right-clicking on any given file or folder. Our McAfee AntiVirus Plus 2017 review is basically the review of the Windows version of McAfee AntiVirus Plus 2017. The first thing you should know is that McAfee has not updated its appearance on platforms such as Mac and mobile. It has only made the necessary changes for the Windows platform. Secondly, McAfee is sincere in its aim to make the user use its security products on all his/her devices. To achieve this, McAfee AntiVirus Plus 2017 has a button located on the Home screen that scans your network and lists out the present devices. Then it tells you that you can install McAfee protection for all these devices. Log into your official McAfee account and then download the official installer for your device. You can also send a link in the form of an email to the device you want to install McAfee on. The link is basically a download link and ties your new device with your McAfee account automatically. Sadly, the McAfee AntiVirus Plus 2017 protection for the Mac isn’t as great as it is for the Windows. It has a firewall feature and does protect macOS devices against macOS x malware attacks which have only grown stronger and more frequent. It also has the scan email feature and has the ability to scan IM attachments for possible malware components. Just like the Windows version, the Mac version has a WebAdvisor feature which guards you while you use your browser. It keeps you safe from dangerous sites and marks all shown search results. The Android version of McAfee AntiVirus Plus 2017 has a bit more meat on its bones than the Mac. In other words, it has more protective features. The Android version comes with the traditional antivirus and WebAdvisor feature. Using these features you can backup your important data at any given time. Moreover, you can use that backup to restore data to your device. It even allows you to use the backup to restore data on another device other than the original. 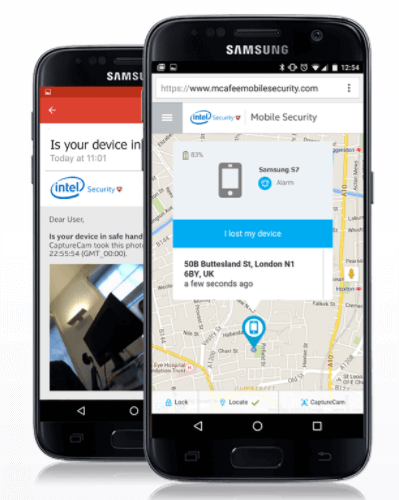 If the Android McAfee AntiVirus Plus 2017 detects that your Android smartphone is running out of power, it quickly transmits the device’s location using its S.O.S feature. Other top antivirus products from companies such as Bitdefender and Lookout have similar features for the Android platform as well. The Android version comes with an App protection feature. This feature finds apps on your Android device that have too-broad permissions. It then ranks them by how they affect your privacy. McAfee AntiVirus Plus 2017 can also filter unwelcome texts and calls. It also has a CaptureCam feature which inaudibly takes a photo of the person who tries to unlock your device or steals it and then tries to open it. There is a Wi-Fi security feature which warns the user whenever the user connects to a public WiFi hotspot that isn’t secure. It can also actively cut the connection when it detects any dishonest activity. McAfee AntiVirus Plus 2017 for Android has a battery optimization feature to allow users to have more screen time. What’s more, McAfee AntiVirus Plus 2017 for Android also works with Android Wear watch. It can send notifications to your watch and can also pair the Android watch with another of the user’s device. That way, the user doesn’t forget to leave his/her other device behind. As you can probably tell, the full feature list is rather exhaustive. The iOS version just like the macOS version isn’t as powerful as the Android version. The iOS version has no antivirus and perhaps that makes sense too. Because you hardly have iOS malware on the market today. The iOS version only offers location and wipe abilities on the iOS. 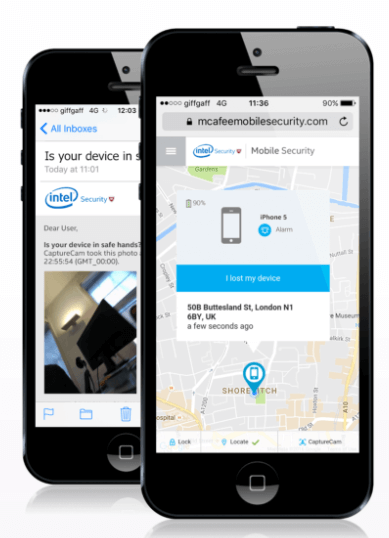 You can’t track or lock your device in real time. As far as the backup feature is concerned, you can only backup contacts. Thankfully, the S.O.S feature is present on iOS devices as well. You also have the CaptureCam feature. McAfee AntiVirus Plus 2017 for iOS can pair with your Apple Watch. And you can configure it to send notifications on your watch. This also protects against losing your device or your watch. If you’re looking for an antivirus product that blows away independent lab tests then McAfee AntiVirus Plus 2017 isn’t it. That doesn’t mean it isn’t good. It has fantastic scores on independent lab tests. But there are other antivirus products that perform better. And you know them as Kaspersky and Bitdefender. Our research shows McAfee AntiVirus Plus 2017 is a great antivirus against malware attacks. But it has lost some of its best feature from the years gone by. So why is McAfee AntiVirus Plus 2017 famous for stopping all malware threats? First, it has a wide range of features to protect you with (only true for Windows and Android). Second, it offers users unlimited licenses. Users can make use of these licenses and install McAfee protection on all their devices regardless of the platform. Currently, McAfee works with Windows, Android, macOS, and iOS. The broad range of protection features makes McAfee AntiVirus Plus 2017 a great buy. With that said, if you don’t want to install an antivirus product on all of your devices then there are other better options. Kaspersky Anti-Virus and Bitdefender Antivirus Plus have tremendous lab scores. Norton Antivirus Basic augments its great antivirus protection with a new powerful feature by the name of Intrusion Detection System. And for those of us who have a lighter hardware, Webroot SecureAnywhere AntiVirus is the lightest antivirus product you are likely to find. What you want is what you get when it comes to antivirus products.